A nice reader gave me the heads up on this via Instapundit. 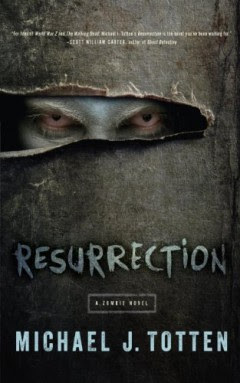 I don't know how long this lasts, but right now Resurrection: A Zombie Novel by Michael J. Totten is FREE. Annie Starling is missing her memory of the last eight weeks—the most devastating in history. It started in Russia and went global in a matter of days, the most virulent virus the world has ever known. It’s stripping its victims of every last thing that makes them human. And that’s just the beginning. The other survivors are no less dangerous than the infected. She meets Lane, who stops at nothing to assert power and control over everybody who’s left; Kyle, who dreams of building a new world upon the ruins of the old; Hughes, who lost the ability to feel after burying his family; and Parker, who threatens to tear himself and his companions apart. And when her memories finally return, Annie discovers a terrifying secret that could change everything—but she can’t tell a soul what it is. I think this is to celebrate the release of the sequel, Into The Wasteland.